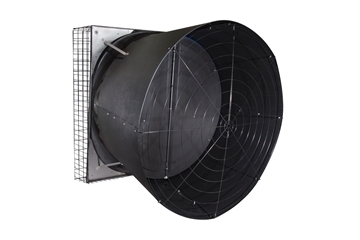 AirStorm fiberglass fans are key components in designing efficient livestock and poultry ventilation systems. • Built with rugged fiberglass housings, stainless steel brackets and hardware to stand up to harsh environmental conditions. • Matched motor and blade combinations deliver dependable, consistent air flows in a full range of static pressure ratings. • Corrosion resistant PVC airflow shutters reduce air drag when open and air entrance when closed. AirStorm fans are refined and tested in our in-house wind tunnel, and their performance ratings and specifications verified by BESS Labs. 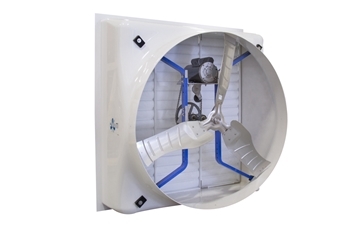 54" fiberglass exhaust fan features innovative X-Brace design constructed of corrosion resistant materials to reduce maintenance time while increasing lifespan and performance. 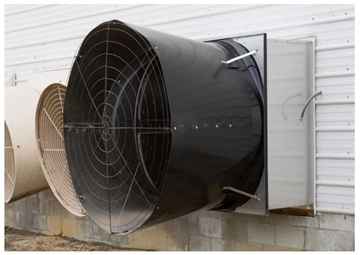 57" fiberglass exhaust fan features innovative X-Brace design constructed of corrosion resistant materials to reduce maintenance time while increasing lifespan and performance. 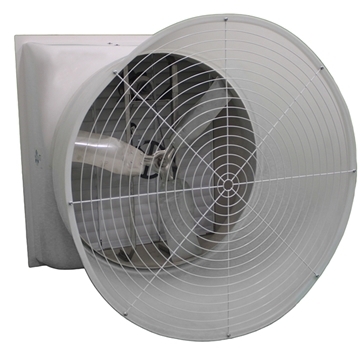 Optional stainless steel kit allows 57" X-Brace fan to be mounted in a through-wall configuration. 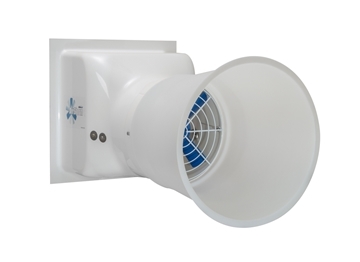 The 14" AirStorm fiberglass exhaust fan includes fan unit and matching PVC shutter. Optional discharge cone available for purchase separately. 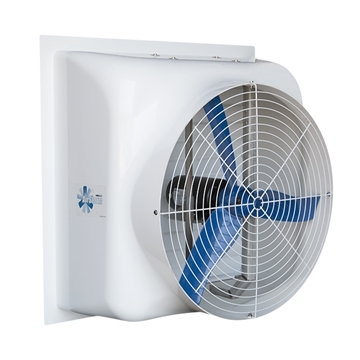 The 18" AirStorm fiberglass exhaust fan includes fan unit and matching PVC shutter. Optional discharge cone available for purchase separately. 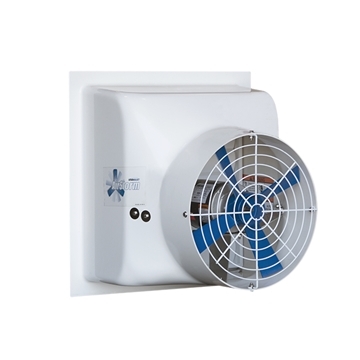 The 24" AirStorm fiberglass exhaust fan includes fan unit and matching PVC shutter. Optional discharge cone available for purchase separately. 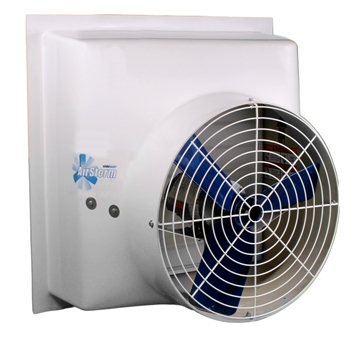 The 36" AirStorm fiberglass exhaust fan includes fan unit and matching PVC shutter. Optional discharge cone available for purchase separately. 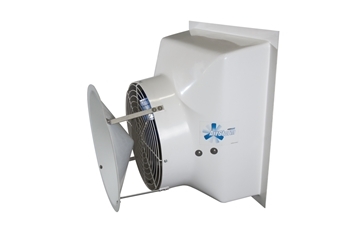 The 54" AirStorm fiberglass exhaust fan includes fan unit and matching PVC shutter. REQUIRED discharge cone purchased separately. 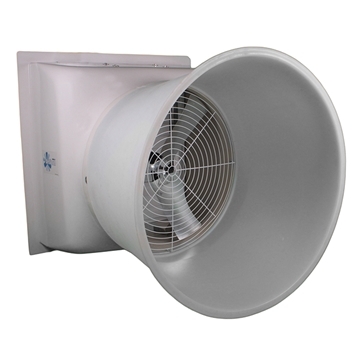 Polyethylene discharge cones for AirStorm fiberglass fans increase fan performance by improving CFM air flow. Available for the 14", 18", 24", 36" and 54" fans. 14" wind diverter kit with stainless steel brackets for AirStorm and other 14" fans. 18" wind diverter kit with stainless steel brackets for AirStorm and other 18" fans. 24" wind diverter kit with stainless steel brackets for AirStorm and other 24" fans. 36" wind diverter kit with stainless steel brackets for AirStorm and other 36" fans.